An eerie morning mist whiting out the sun over the Sammamish slough in late November. This is one of my favorite haunts in our area, I can frequently be found here, walking my dog, reveling in the natural beauty that surrounds us. For more information, see my past posts here and here. I could barely move in the cumbersome suit. For those like me of an age, this life was harder. Too many memories of being free, the sun on our shoulders. We remembered. Humans are good at adapting. We adopted the new ways; we survived. Life went on, technology protecting us from ourselves. Moving down the path, I looked back one last time, catching sight of the burning white sun. Feeling the air on my skin was worth it. I missed the old days. Thank you – I will head over to read yours! I’m thinking here that we’ve made a bit of a mess of our poor planet. I like your point that life is harder for those who remember something better, while the young have never known anything else. Imagine what daily life will be like if we actually colonize in space. Great pic with interesting stories being posted. Yes – I’m reading about a future with life under the sea due to radiation above ground. There’s another environment that would require protective gear! Tis a story after my own heart. Well rendered. Those white suits can be so cumbersome, but yes, we do adapt. Oh this is such a stark picture you paint… we adopt but imagine how we would regret what we have done.. Very good picture .. thank you. I’m glad you liked it – I hope we don’t get to that point! You created an alternate world very well. Thank you! It felt like the way to go. Will we ever wake up or is this inevitable? Probably not wake up so . . . our offspring and theirs will have to adapt to a new lifestyle. White is not my color. Nor is it mine…here’s to waking up before then. Thanks for reading! I like that you took this in an unexpected direction from the dog and slough milieu. There’s a lot going on in these 100 words. Your picture has been a touchstone for many of us to ponder the future of our ecosystem. Nicely done! Interesting to note that the picture take from the other direction in that same part shows a bright, sunny world. Thanks for reading! Thanks for the lovely picture. Thanks, Dawn! In LA this week and there is a wildfire creating smoke and an ominous haze…a little more real than the mist shown here. Wonderful photo, Erin. So atmospheric! They used mine last week, and it was so fun seeing all the stories that come from your vision, yes? I found your image highly evocative and had a few stories come to mind. It was very tempting to a do a futuristic, apocalyptic story… it brings that to mind. But, I knew others would do it better, and here you are! 😉 Nice job on both counts! Thanks – I’m glad you liked it. Next week, a happier story. thank you for the photo, Erin and an interesting story. ah, to be human and have the ability to adapt…a wonderful existence. Looks like we’re neighbors. Awesome photo…and a story that makes for thoughtful reflection. I’ll have to go visit your site and see your story! Thanks for your photo as prompt! Thanks, Joanna – I agree, according to the news this morning, the next 15 years are crucial. I plan to be very intentional and do my part to prevent of future like this one. Strange apocalyptic approach to your own prompt. I really like this picture, one of my favorite prompts ever. Thanks for sharing it! 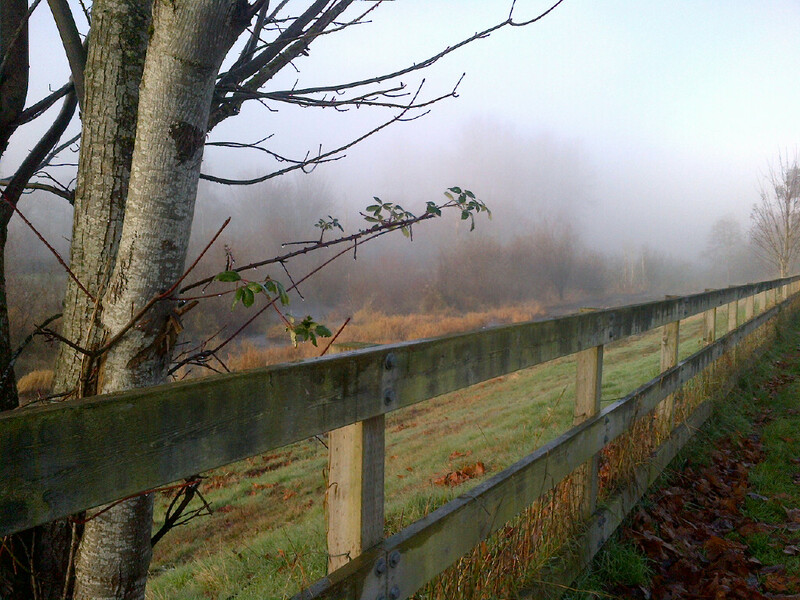 The photo was taken Thanksgiving morning and it was a sunny day, just still early enough for the mist to be heavy. I still had to lean on the doom and gloom it evoked. Maybe next week I’ll aim for a laugh. Surely a glimpse of the future to come unless we start mending our ways now. Thanks for sharing the picture. You’re welcome! And thank for reading mine! You’ve artfully told an entire story, past, present and bleak future, in 100 words. Applause! I have such new-found respect for you! I read all 101 entires this week to see what people did with the prompt and it was exhausting! I know how hard you work to comment on evryone’s piece- and how much your words matter to them. I appreciate the time it takes to get through everything. Thank you for reading! I’m glad you liked the photo. What a stark reality and scary because it is so realistically written. Great story and wonderful photo for the prompt. It’s inspired so many different stories from what I’ve been able to read so far! I’m glad you liked it! It was fun to see what people did with it. Ah, the old PPE (personal protective equipment). I’m always a little grumpy about wearing mine. Hi Russell, thanks for reading. Next week, I’ll try to work in a straightjacket just for you. Well, Erin, you photo sure spawned a lot of ‘not so good future for us’ stories… I liked yours and the way she/he went out. Thanks for the 180 photo… fun to see and quite beautiful. Sammash… Photo at top of page… Hmmmmm… seems so familiar… Why I do believe that’s Mt. Baker! Because it is! That’s looking northeast from Whidbey Island at Saratoga passage. Yes – I hadn’t intended to go there, but that’s the story that came to mind! Thanks for reading.